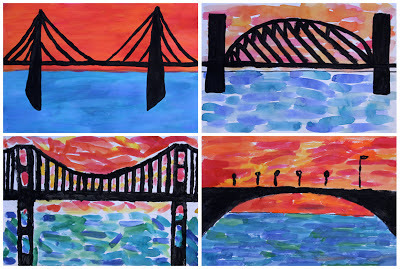 These bridge silhouettes were created with a year 6 class. I had this class in their final weeks of primary school, so there was not a lot of ongoing work and we were able to finish these within the one day I was there. It was an idea I'd been thinking about and looking forward to trying for a good while. In fact I told the class how excited I was and that I had even been “dreaming of this lesson”, which made a few students laugh out loud! The students sketched their bridge and horizon line in pencil and then traced their outline with permanent marker. 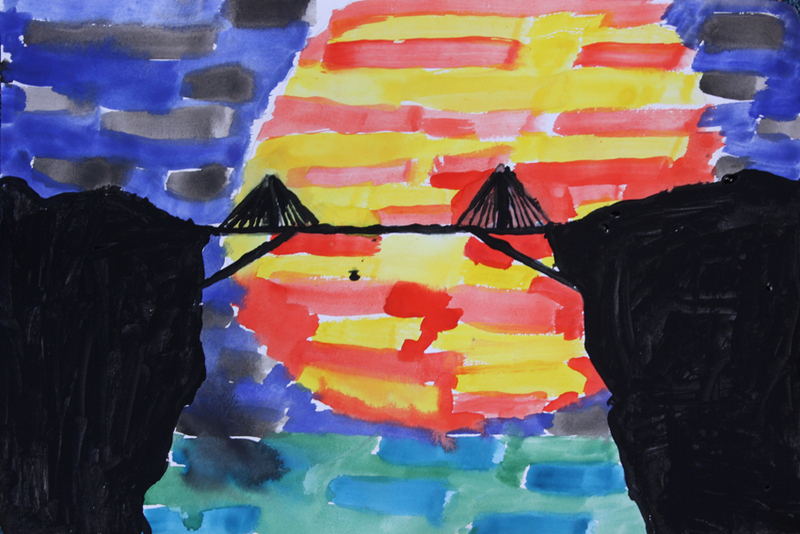 They were asked to draw their bridge front-on, in 2 dimensions, with strong lines and ideally without too many intricate details. 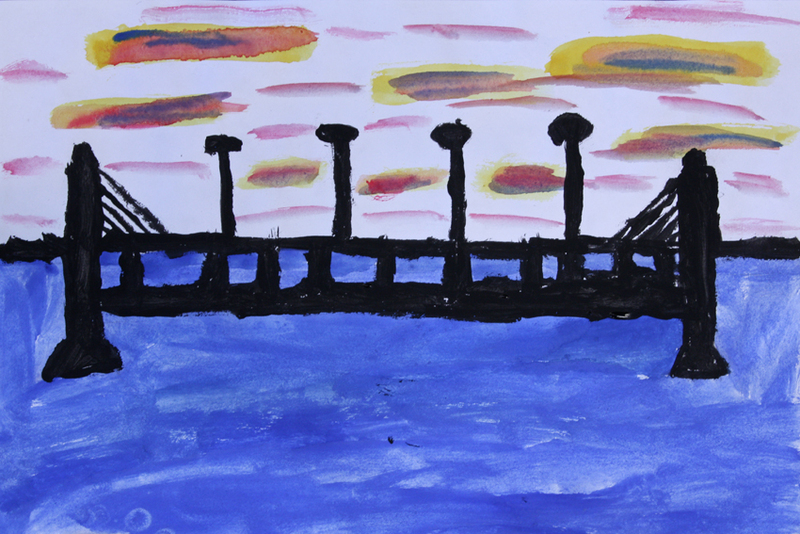 Next, they used watercolours to complete both the sky and water. 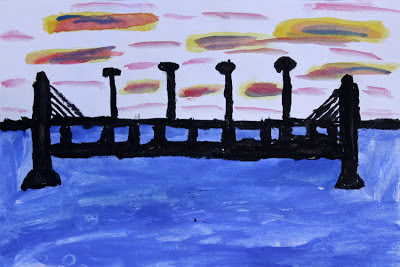 I left this open to their interpretation but the example I prepared was of a sunset (sans actual sun). With the permanent marker down they were able to cover the entire paper with their watercolours and still see the bridge outline through the paint. 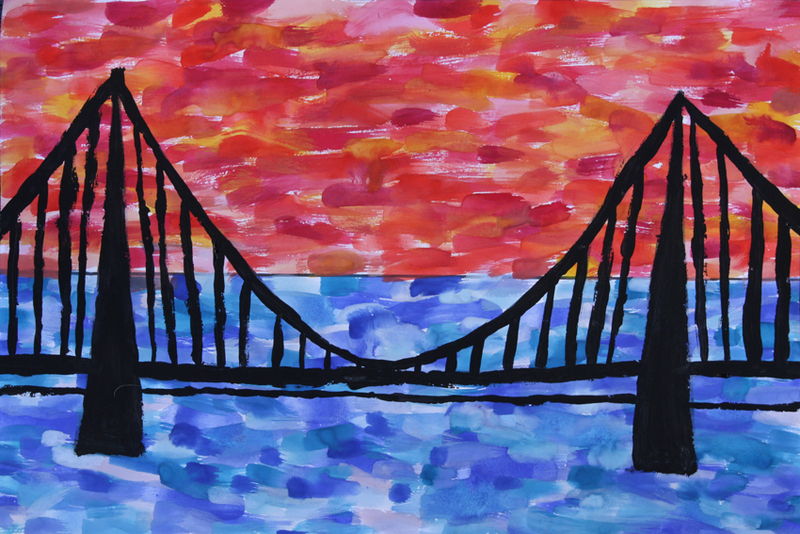 The final step was to help their bridge structures really stand out. 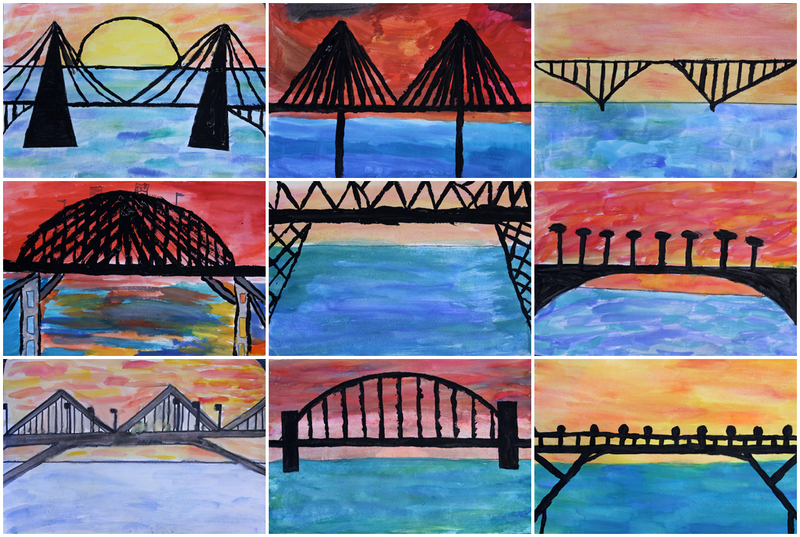 Once the watercolours were dry (or mostly dry) they retraced their bridge outline, but this time with regular black acrylic paint. With regular classroom quality brushes this step was the main reason I asked that they keep their bridge construction from being too elaborate. It's hard to paint thin lines with not-so-thin brushes! The students did a great job and I really like the variety of approaches across the class. I really do like this! 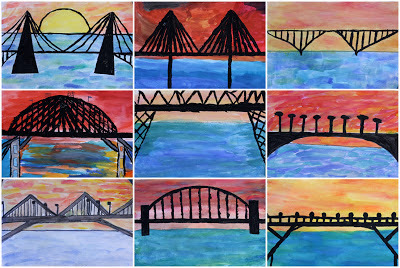 I usually will do a sunset with a city scape kind of like this, but the bridge could be a very interesting take! Super cool lesson- the contrast between the bridges and the background is striking and so effective. Thanks for sharing! Thank you so much for this! I'm about to start teaching in a new school with Year 5 and 6 students whose topic is Water. My job share is in charge of the topic side but I've been tasked with the associated artwork. This looks perfect so thank you for your detailed description of the process. Google's come up trumps again! 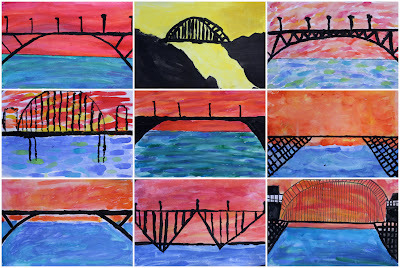 Love this so, so much - I am using it as an inspiration with my Class to create an image of the Clifton Suspension Bridge.